Rising a vertical 200 metres over the surrounding densely forested plains Sigirya Rock, located in the northern Matale District in Central Sri Lanka, is a colossal edifice formed from the cooling magma of a now extinct volcano. It’s flat topped summit, reached by 1200 lung bursting steps and a final rickety metal staircase houses the fascinating remains of an ancient civilisation. The fortress was built 1000 years ago by King Kasyapa. The story of this king and his evil plot to overthrow his father is like a fairytale. It is said that he betrayed, imprisoned and killed his father and then buried his body in the walls of his new palace. After Kasyapa’s reign ended with his own violent death a Buddhist monastery took over the care of the rock and its’ incredible views before being abandoned in the 14th century. There are still many echoes of Sigirya’s history to be explored across the site and the land below and it is listed as a UNESCO World Heritage site for being a fine example of ancient urban planning. Climbing Sigiriya Rock is an ascent into history that’s for sure! It’s a good idea to arrive either early or late to avoid the crowds. The summit is reached via the 1200 steps sliced, and in places, bolted to the rock. At busy times queues form however at least this will make a rushing tourist take the time to really appreciate the view of the emerald carpet of trees and gardens below. The western wall of the rock is decorated with painted frescos. Created in the time of King Kasyapa they are thought to be paintings of his wives and concubines and are a stunning depiction of female beauty and curves in ancient times. Colour and detail has been preserved in eighteen of the frescos giving many clues to historians and anthropologists about how these ancients lived. Another wonderful part of Sigirya is the mirror wall. It was originally highly polished so King Kasyapa could look at his reflection. It is now a quirky example of an ancient visitors book as the wall is home to inscriptions and poems painted onto the rock by visitors to to area. The earliest words date back to the 8th century. Tourists and locals alike have to be wary while visiting Sigirya. The boards of monkeys galloping around are nightmarishly cheeky. Don’t whatever you do leave bags open or things on the floor…long fingers will creep in for a rummage. And have your wits about you if you eat. The monkeys are intimidating little thieves! It takes around two hours to climb to the top but the ruins of the citadel on the plateau are absolutely worth the climb. We visited in the afternoon and watched the sunset as we climbed back down was breathtaking as the pink sky bathed the mountains in the distance. 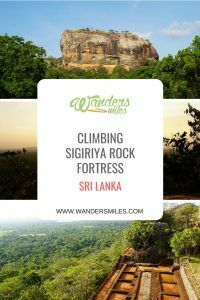 It’s possible to visit Sigirya Rock with just a guidebook to explain the sights but that local guides are great at adding colour and drama to the stories and history of this amazing place. Below the rock are beautiful gardens and lily covered ponds and waterways, definitely worth exploring if you have the time. There are the ruins of pavilions and archeological evidence of when it was the centre of monastic activity in the area. As we wandered back to the entrance in the twilight, cobra hood cave, named for the tall, curved shape which looms over visitors. The snake charmer dwelling in the cave showed us the elegant pythons he hypnotised to dance. The spectacle left me a little unsettled and while the others in the group handled the creatures I kept my distance. Sigirya Citadel Rock is situated in the very heart of Sri Lanka between the towns of Dambulla and Habarane. A 30 minute bus trip from either town is the cheapest, most convenient way to travel. The entrance fee is around $30 which may seem a little expensive. However, it truly is a once in a lifetime chance to see the remains of an ancient civilisation in a truly stunning location so I think it’s worth it. February to April has moderate climate and is generally the best time to visit. However, the rest of the year sees average climate as well with the highest temperature going to around 31 degrees celsius. The weather in the area is typically hot and humid and this is made more oppressive by the heavy tree cover as you arrive and leave. Our evening exploration was perfect as the temperature was a little cooler allowing a much more leisurely pace. Even then though we have to be mindful of hydration, sun cream and a hat. Dambulla or Habarane would both make great bases for a trip to Sigirya Rock but to make life easy, there are lots of hotels within 2-5 km of the landmark in Sigiriya. Cassandra Culture Resort is a 3-star hotel with outdoor pool, sun terrace and BBQ area. It is located approcimately 5 km from Sigiriya Rock and 4.3 kmi from Pidurangala Rock. .
EKHO Sigiriya is a 4-star resort located 801 m from Sigiriya Rock, where every hotel room is air conditioned and comes with a flat-screen TV. Some units have a seating area where you can relax and some with views of the mountain or garden. Water Garden Sigiriya offers a spa and wellness centre and a fitness center. The 5-star resort has spacious air-conditioned villas, an outdoor pool and offers views of the Rock.